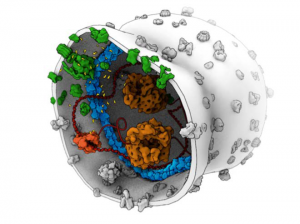 Artist’s impression (Graham Johnson) of a synthetic cell, representing the three basic processes taking place in a living cell: cell fuelling (green), DNA processing (orange/red), and cell division (blue). In the BaSyC programme we take on the challenge to bring the essential components of a cell together, controlling the complex interactions among them, and constructing a synthetic cell with the basic functionalities of a living cell: self-sustained growth, transmission of information, and division. Constructing a synthetic biological cell is one of science’s greatest challenges of the 21st century. We already have extensive knowledge of the molecular building blocks that form the basis of life, but we do not yet understand how they work together to make life possible. The cell is the basis of all organisms. 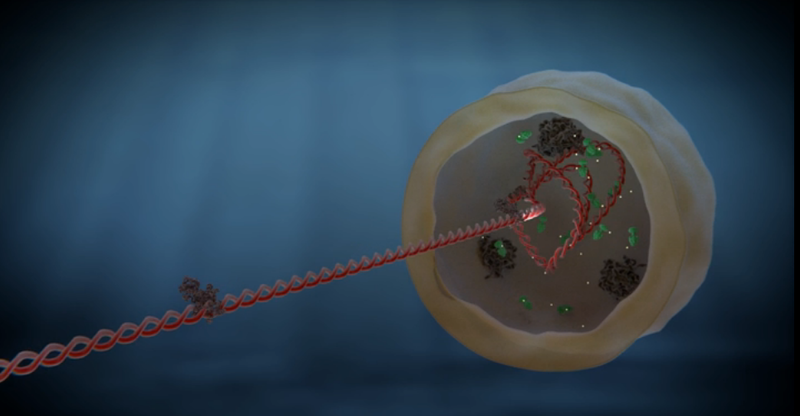 ‘The BaSyC consortium therefore aims to combine biomolecular building blocks to construct an autonomous, self-reproducing cell: a cell that can maintain its own integrity, grow and reproduce’, says coordinating scientist Prof. Marileen Dogterom, head of TU Delft’s BioNanoscience department. Knowledge of the processes of life opens up unprecedented opportunities for a healthy and sustainable world in many areas of healthcare, agriculture, materials and energy. According to Dogterom, a better understanding of the molecular basis for cellular behaviour can contribute to the future development of more targeted medication and personalised treatments for chronic diseases and cancer, for example. ‘Potential applications include new screening methods for antibiotics and medicines, biosensors and solutions to antimicrobial resistance’. Designing synthetic cellular systems will also enable humankind to produce new, smart and environmentally-friendly materials in the high-tech industry, new biofuels and biodegradable polymers. It will also help facilitate the sustainable production of safe and healthy food. AMOLF group leader Prof.dr. Gijsje Koenderink is co-applicant of the Gravitation program. Other AMOLF group leaders involved are prof.dr. Sander Tans, prof.dr. Bela Mulder and prof.dr. Pieter Rein ten Wolde. With the NWO Gravitation program, the government is encouraging outstanding research in the Netherlands. It is intended for scientific consortia that have the potential to rank among the world’s best.